Homemade marshmallows are easy to make, and so much fun to give as a gift with hot chocolate mix. Personally, I love them in s'mores. The only trick is cutting them out. It's a sticky situation. I find it easiest to use a dough scraper, or a pizza cutter sprayed with non-stick cooking spray. If you use a dough scraper, press down using the scraper to make a cut rather than slicing. Place the gelatin into the bowl of a stand mixer (KitchenAid) along with 1/2 cup of the water. Place over medium high heat, cover and allow to cook for 3 to 4 minutes. Uncover, clip a candy thermometer onto the side of the pan, and continue to cook until the mixture reaches 240 degrees F - approximately 8 to 10 minutes. Once the mixture reaches this temperature, immediately remove from the heat. While the sugar is cooking, prepare a 9 x 13 pan by lightly spraying it with nonstick cooking spray. In a small bowl, whisk together the powdered sugar and the cornstarch. Sprinkle the sugar/cornstarch mixture into the 9 x 13 pan and move around to completely coat the bottom and sides of the pan. Return the remaining sugar/starch mixture to the bowl for use at the end. Put the whisk attachment on the mixer and turn to low speed. While the mixer is running, slowly pour the sugar syrup don the side of the bowl into the gelatin mixture. Once you have added all of the syrup, increase the mixer speed to high. Continue to whip until he mixture becomes very thick and is lukewarm -- approximately 15 minutes. Add the peppermint and mix to combine. Spray a spatula with the non-stick spray. Pour the marshmallow mixture into the prepared pan and spread evenly using the spatula. 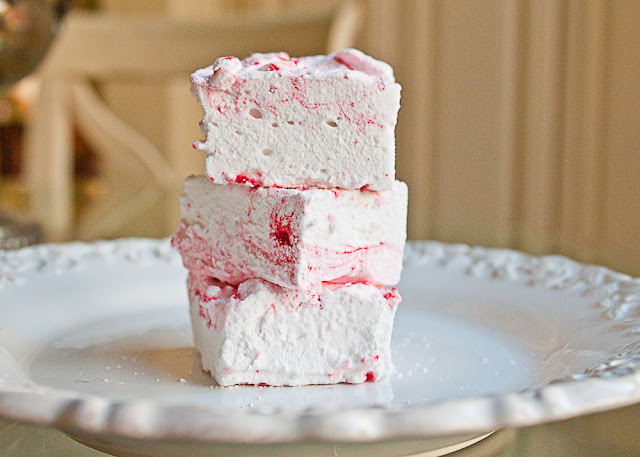 Drop red food coloring onto the marshmallows and use a toothpick to swirl the food coloring into the marshmallows. Dust the top with enough of the sugar/cornstarch misture to lightly cover. Reserve the rest for use after the marshmallows have been cut. 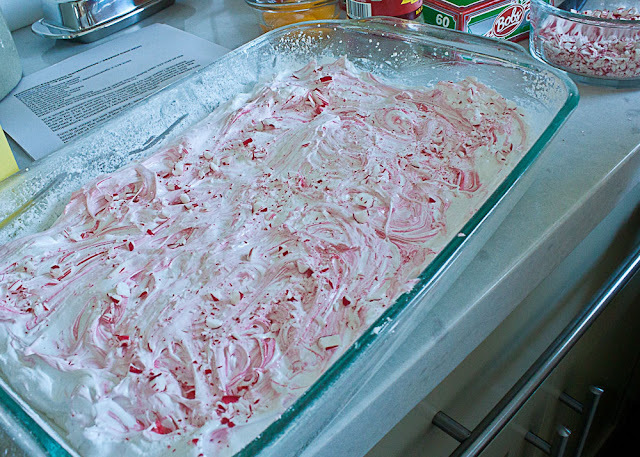 Allow the marshmallows to sit uncovered for at least 8 hours or overnight before cutting. When ready to cut, turn the marshmallows out onto a cutting board. Spray the pizza cutter, or dough scraper with non-stick spray and cut the marshmallows into 2-inch squares. Once cut, toss each marshmallow into the bowl with the sugar/cornstarch mixture to coat.